In the first Irish Polling Indicator for the 32nd Dáil, Fine Gael and Fianna Fáil are leading the polls with estimates around 26% each. The Irish Polling Indicator pools all Irish opinion polls to arrive at an overall estimate of where the parties stand. Fine Gael support has not changed since the February elections. The party is currently estimated at between 24.5% and 28.5%. Fianna Fáil had seen a bit of an increase in support in early July, but is currently back around General Election levels: 22.5% to 28%. The difference between the two top parties is so small that we cannot conclude which one is currently enjoying more popular support in vote intention polls. Sinn Féin is doing relatively well in opinion polls. The party is now at 18.5% (plus or minus 2%), which is higher than the 13.8% they obtained in the February elections. The problem with estimating Sinn Féin support, however, is that most of the time they do better in polls than in actual elections. In the very last Polling Indicator before the elections in February, the party was estimated to stand at 16.5%, but it achieved only 13.8% of the vote four days later on Election Day. An analysis by Red C suggests that late swing could explain most of this gap, but polls might also overestimate Sinn Féin support for other reasons (sampling, likely voter weighting). Whatever the reason, the current standing of 18.5% is higher than the last Sinn Féin estimates in the February pre-election polls, so their increase in support seems at least partly real. 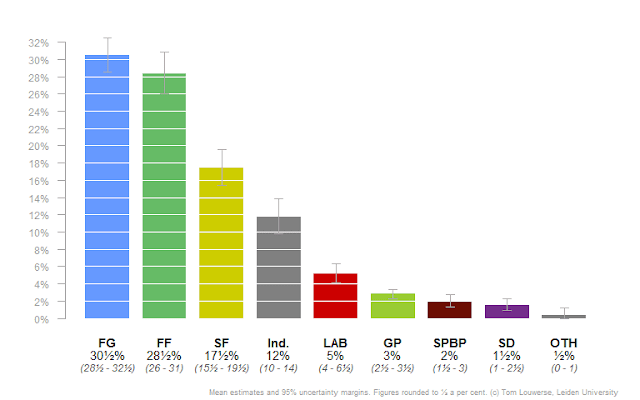 As it stands, Independent candidates (including the Independent Alliance) have been losing some ground since February. They are currently estimated at 13.5% (between 11.5% and 16%), which is about 4% lower than their February result. We should note that one pollster, Millward Brown, had them significantly lower than all other polling companies at 8%. Still, most pollsters have independents at 14%-16% in their most recent polls, which is somewhat of a decrease compared to the election result. Labour shows no signs of recovery after their election defeat in February. Support for the former government party is actually quite stable at 6.5% (plus or minus 1.5%), which is almost exactly what they obtained in February. We see something similar for the smaller political groupings with AAA-PBP at 4.5%, the Green Party at 2.5% and the Social Democrats at 2%. Only for the Social Democrats this is statistically significantly lower than in February (but only marginally). For all of the smaller parties a margin of error of around plus or minus 1% applies. Renua Ireland, which failed to win any seats in February, seems not to be doing very well in the polls. Because not all pollsters report separate figures for Renua, it is included in the ‘Others’ grouping, but that is polling only half a percentage point in total. Even if all of that support were for Renua, this does not bode well for the party. Indeed in most polls Renua is on 0 or less than one percent. The Worker’s Party also finds some support in some opinion polls, but likewise is not separately reported in all polls. All in all, the picture that arises is one of relative stability. Despite the erratic process of government formation, at least for Irish standards, voters do not seem to be moving towards or away from the Fine Gael minority government, at least not in significant numbers. Perhaps the decrease in support for independents might be linked to independent support for the government, but this is not clear, as there are also many independent candidates that are not involved in the minority government. The Independent Alliance, which is separately reported in some polls, does not seem to gain or lose support. Only a few days before the election, polls continue to indicate that this might be the election of the independent candidates and smaller parties. The group of Independents and others has improved their total score from about 22% early this year to 25% in the latest Irish Polling Indicator, which combines all opinion polls into one estimate. 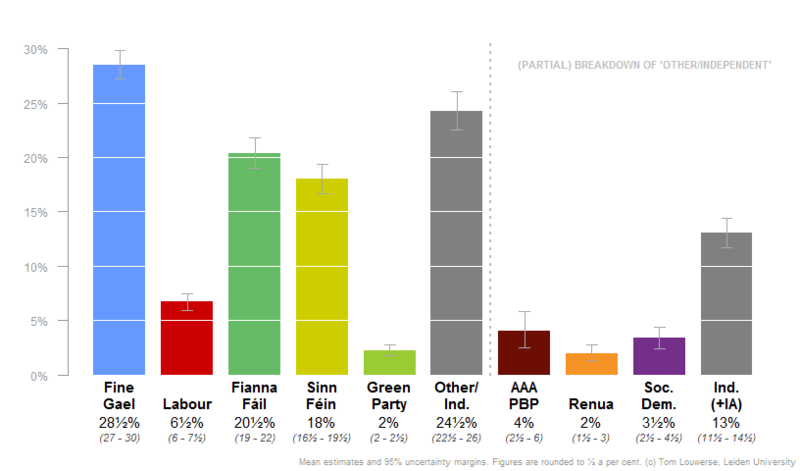 Within that group the Social Democrats are doing particularly well recently, currently polling well over 3%, with AAA-PBP on almost 4% and Renua on 2%. Independent candidates, including the Independent alliance, are now on more than 14% support. Sinn Féin, on the other hand, has seen a significant decline in support: from 19% in January to under 17% now. In 2015, the party was even competing with Fine Gael for first place, but that seems far out of reach now. Compared to the last election, seventeen per cent is still a considerable increase, but as in previous election the party seems to lose some support during the last weeks of campaigning. The government parties are not getting any campaign boost either. Fine Gael did very well in the last part of 2015, but its momentum has stalled. The party is now at 28.5%, which puts the party in the lead, but it probably won’t be enough to save the coalition. This is also due to the poor showing of Labour, which is at 6.5% in the most recent Polling Indicator. This is a marginal decline from early this year (-1%), just at the borders of the margin of error. Fianna Fáil is doing relatively well at 21%. There seems to be a modestly positive trend for the party over the last weeks, but this is also inside of the margin of error. 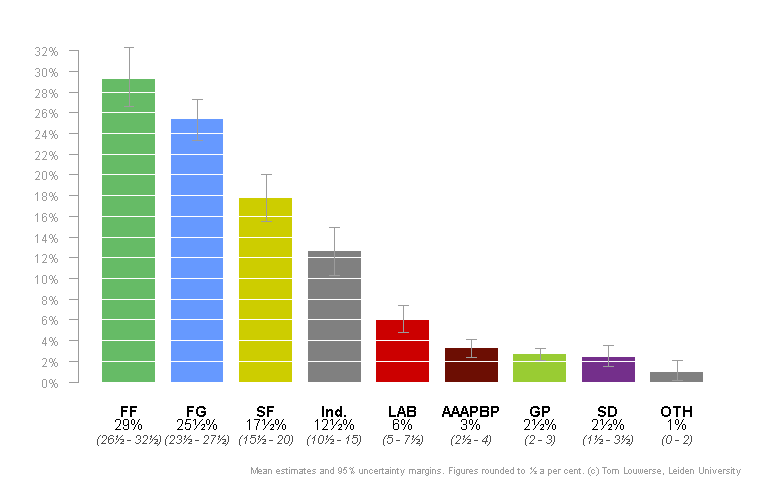 With Sinn Féin slipping, however, Fianna Fáil is now the second party in the polls. Their former coalition partner, the Green Party, has improved a little bit over the last few months, but it still polling at low levels: just over 2%. This is where the polls stand a couple of days before the elections, but it is important to note that some people still need to make up their minds. In most polls, more than 10% of respondents are still undecided. Moreover, the gap between Fine Gael and Fianna Fáil is much wider in some polls (10% with Red C) than others (4% with Millward Brown). 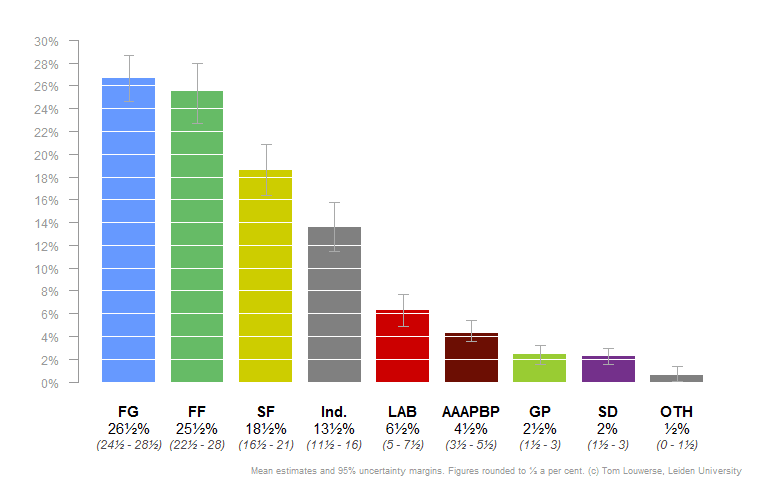 This averages out to about 7.5% in the Polling Indicator, but the large discrepancies between pollsters point to some uncertainty as to exactly how big Fine Gael’s lead is.